Late last May, Sharanabasappa Deshmukh and C M Kalleshwaraswamy, entomologists at the University of Agricultural and Horticultural Sciences (UAHS) in Shivamogga (Karnataka), collected a few larvae from the 10-day-old maize crop on their research field. It was a routine exercise. The larvae, too, looked like oriental armyworm (Mythimna separata), a not-so-uncommon insect pest. But after 45 days, when the caterpillars had developed into full-grown moths in their laboratory, the two plant insect specialists were in for a surprise. “The moths were totally different from oriental armyworm. Further tests, which included their DNA sequencing at the Indian Institute of Horticultural Research in Bengaluru, showed these to be the fall armyworm (FAW, scientifically known as Spodoptera frugiperda), which had never been found in India,” says Deshmukh, who was the first to report the pest in the country. The backdrop to the unexpected finding was the infestation of Karnataka’s maize crop by the oriental armyworm in the preceding 2017 season. This pest was known to strike once every 10-12 years. Even when it caused damage — similar to an army that “marches” slowly forward and consumes any foliage on the way — the long window between attacks made the insect somewhat less deadly. But FAW was a new, totally unwelcome, visitor. “Unlike oriental armyworm, FAW isn’t a cyclical pest that comes intermittently. Instead, it is a continuous pest that is nearly always present and can build permanent populations. Not only is it a far more serious threat, but the measures to control the pest are also ad hoc. We don’t have a set protocol of controls right now,” explains Deshmukh. Native to the Americas, FAW has, since 2016, been aggressively moving eastwards, infesting Africa and making landfall in India last summer — the scientist duo at UAHS detected it in July 2018 — before spreading to Sri Lanka, Bangladesh, Myanmar, Thailand and China’s Yunnan Province. Within India, FAW attacks have already been reported from even Maharashtra, Andhra Pradesh, Telangana, Tamil Nadu, Madhya Pradesh, Chhattisgarh and West Bengal, while causing damage to the maize, jowar (sorghum) and, to a limited extent, sugarcane crops in these states. Both oriental armyworm and FAW are polyphagous; their larvae feed on a range of host crop plants. The former, though, does not spread very fast, which is why the damage from it in 2017 and even 2018 was largely confined to Karnataka. The adult FAW moth, in contrast, can fly up to 100 km distance every night, allowing it to invade new geographies very quickly. Besides, an adult female can lay 1,500-2,000 eggs during her entire life cycle of 45 days, as against 100-200 eggs by the oriental armyworm. The FAW moth normally lays eggs on the upper side of the plant leaves, with the larvae hatching in 2-3 days. The roughly 30-days larval stage — the caterpillar goes through six parts or ‘instars’ — is the most dangerous. During the last three instars, the growing larva feeds on the leaves, whorls, stalks and flowers of crop plants. Once this stage is completed, the growing moth pupates in the soil – for 8-9 days in summer and 20-30 days in cool weather. The nocturnal egg-laying adults live for about 10 days, during which they migrate long distances. The government’s reported move to allow five lakh tonnes of duty-free maize imports has been attributed mainly to a lower 2018-19 crop from a combination of drought and FAW infestation in major producing states. Experts, however, fear that the worst is yet to come. C D Mayee, plant epidemiologist and president of the New Delhi-based not-for-profit organisation South Asia Biotechnology Centre (SABC), feel that the hot and humid climate during the monsoon season is particularly conducive for the propagation of the pest. “The problem has to be nipped in the bud, through constant vigilance on the part of farmers, right from day one of vegetative growth. Treatment of seed before sowing and setting up pheromone traps in fields should be made standard practice for maize growers. Farmers must take up spraying insecticides even if 2-3 moths get trapped,” he advises. Pheromones are natural compounds emitted by female FAW moths to attract males for mating. Pheromone traps basically use synthetic versions of these compounds to attract and catch male moths, which can, then, be counted to detect any significant FAW presence. While timely spaying may help, what is interesting, however, is that the Central Insecticides Board and Registration Committee under the Union Agriculture Ministry is still to recommend any specific chemicals for fighting the pest. For the 2018 kharif season, the body which regulates and sanctions usage of crop protection chemicals in India had allowed spraying of select insecticides/formulations — carbofuran, phorate, thiamethoxam (12.6%) plus lambda-cyhalothrin (9.5%), and chlorantraniliprole 18.5% suspension concentrate — on a trial basis. That sanction has since lapsed. “The best way to avoid FAW infestation is to ensure that farmers in a given area sow around the same time. Staggered planting allows the pest to move from field to field, making control difficult. Farmers should also go in for removal of egg masses and newly-hatched larvae,” says Deshmukh, even as he admits that only ad hoc control measures are being advocated as of now. “We have also suggested the application of bio-fungicides such as Nomuraea rileyi, which give good results in the long run. But farmers aren’t very keen, as they want immediate action after application,” he adds. Ankush Chormule of 6th Grain Corporation, a Singapore-based farm advisory firm, points out that state agriculture departments have so far not even included FAW in the list of pests to be monitored on a regular basis. “The need of the hour is to raise awareness, covering both pre- and post-sowing pest management. This should be done on a war footing well before the coming kharif season. 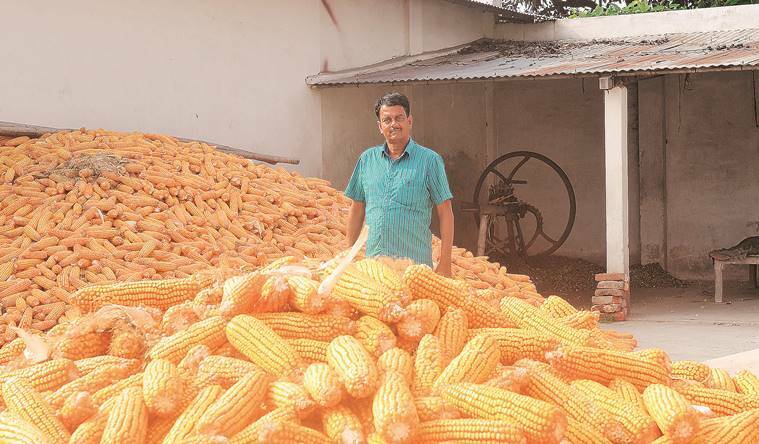 At the current rate, it would be a matter of time before the insect moves from maize to even sugarcane in a big way,” notes this entomologist, who along with his colleague at 6th Grain Naresh Shejawal, were the first to identify FAW infestation in Maharashtra. SABC, on its part, has launched a project SAFFAL (Safeguarding Agriculture and Farmers against Fall Armyworm) in collaboration with the US agrichemical major FMC Corporation. “The programme aims at developing a suite of techniques, good agricultural practices and control measures, along with educational material for various stakeholders, to tackle the pest. At stake is India’s food security,” sums up Mayee.